Mircea Cantor: The Need for Uncertainty 2 April � 1 June 2008. MODERN ART OXFORD, 30 Pembroke Street, Oxford 0X1 1BP Tel. 01865 722 733 | http://www.modernartoxford.org.uk | info@modernartoxford.org.uk Free admission. Mircea Cantor�s videos and mixed media installations address the notion of displacement and parallel realities. Cantor presents a stunning new sculptural installation in Modern Art Oxford�s Upper Gallery exploring the theme of uncertainty. Wood carvings in a forest and a flying carpet hand-woven with figures of angels and aeroplanes are some of the elements used by Cantor to prompt reflections on worlds within worlds and the relative notion of freedom and its limitations. The exhibition is the first in an ambitious new series of commissions produced in collaboration with Arnolfini, Bristol and Camden Arts Centre, London. Born in 1977 in Oradea, Romania, Mircea Cantor lives and works in Paris and Cluj, Romania. 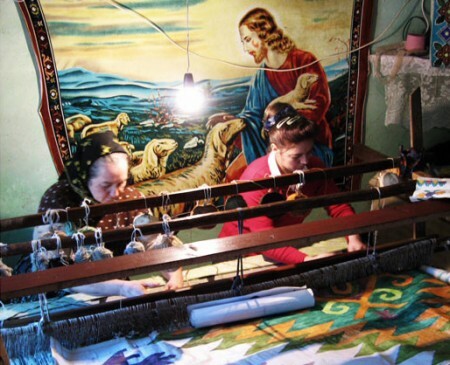 Image above: Making the 'Airplanes and Angels' carpet in Maramures, Romania, February 2008. �Mircea Cantor The Ratiu Foundation / Romanian Cultural Centre in London are happy to support financially Mircea Cantor�s exhibition at Modern Art Oxford.